The Coraciiformes are a group of usually colorful birds including the kingfishers, the bee-eaters, the rollers, the motmots, and the todies. They generally have syndactyly, with three forward-pointing toes (and toes 3 & 4 fused at their base), though in many kingfishers one of these is missing. This is largely an Old World order, with the representation in the New World limited to the dozen or so species of todies and motmots, and a mere handful of the more than 90 species of kingfishers. 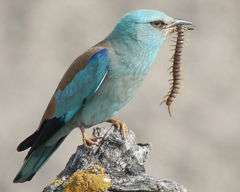 This order has been seen to be something of a mixed assortment, and the Coraciiformes may be considered as including only the rollers. All the other families would then be considered to represent lineages of birds distantly related to Coraciiformes. This seems to be oversplitting, as most Coraciiformes indeed form a reasonably robust clade. Analysis of nDNA c-myc and RAG-1 exon as well as mtDNA myoglobin intron 2 sequence data demonstrates that the Coraciiformes can be divided into a basal group that is not too distantly related to the Piciformes, and a derived suborder containing mainly kingfishers (Johansson & Ericson, 2003). The cuckoo roller's true affinities appear to lie elsewhere. The trogons and hornbills are either very basal lineages, or might be considered distinct own orders; the latter are apparently slightly closer to the rollers than the former. The entire group (possibly excluding the cuckoo roller) and the Piciformes are closely related to the Passeriformes (Johansson & Ericson 2003; see also near passerine). 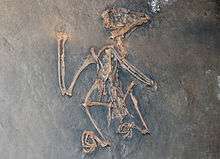 Several extinct coraciiform families are only known from Paleogene fossils. They probably belong to the basal group and are sometimes difficult to assign because they were even closer still to the Piciformes (see also Neanis). In addition, there are some prehistoric genera which are likewise difficult to place into a family. At least the Eocoraciidae are very basal, but the Late Eocene (some 35 mya) Geranopteridae form a superfamily Coracioidea with the extant rollers and ground-rollers already (Mayr & Mourer-Chauviré 2000). A few prehistoric taxa of the present-day families have been described; see the family articles for details. Genus Quasisyndactylus (fossil; Middle Eocene of Messel, Germany) - alcediniform, basal? Genus Cryptornis (fossil; Late Eocene of France) – bucerotid? geranopterid? The Leptosomatidae (cuckoo roller) probably do not belong here. The trogons are sometimes placed here as a family Trogonidae. The Late Eocene Palaeospizidae are sometimes also placed in the Coraciiformes, as are the Early to Middle Eocene Primobucconidae and the Middle Eocene to Early Oligocene Sylphornithidae. The Primobucconidae at least indeed seem to belong here.